Even though vehicle ownership comes with great responsibility and costly expense, there are a large number of positives that outweigh the negatives. But, for anyone who has owned and operated a vehicle for long enough, you may know the hassles that come along with owning one. Two of the largest hassles come in the forms of components failing, and abandonment when your vehicle breaks down on the side of the road. While you may not be able to predict when your vehicle will breakdown next, you can be fully prepared to take care of the issue when it does occur. Do you think you’re prepared in the event your car breaks down? Find out by testing your skills, and finding out just how well you’d fare in the event of a mechanical breakdown! If you feel your vehicle acting out of the ordinary while you are driving, you may be in danger of breaking down! Luckily, there are a few tell-tale signs your vehicle is not operating as it should, allowing you to react properly to avoid additional damage. When your vehicle is in the beginning stages of breaking down while driving, you may start to feel your engine power reducing, your vehicle shaking a lot harder than normal, and unnatural smells emanating throughout the cabin. Another tell-tale sign regularly ignored, your engine light may begin illuminating on the dashboard indicating an internal issue. If any of these events occur, you will want to lift your foot off of the pedal gently, allowing the car to continue rolling and come to a stop on its own. While your vehicle is in the process of rolling to a stop, you should put your vehicle’s hazard lights on and proceed to move to the side of the road or enter an empty parking lot to wait for a tow truck if needed. What to Do After You Pull Over? Once you pull your vehicle over to the side of the road, you will need to indicate your vehicle is inoperable to provide safety to yourself and others on the road. If you are lucky enough to move your vehicle into a parking lot or empty lot, you may not be required a few of these next steps. If you are broken down on the side of a road, parkway or highway, it is recommended that you follow these steps to ensure your safety. 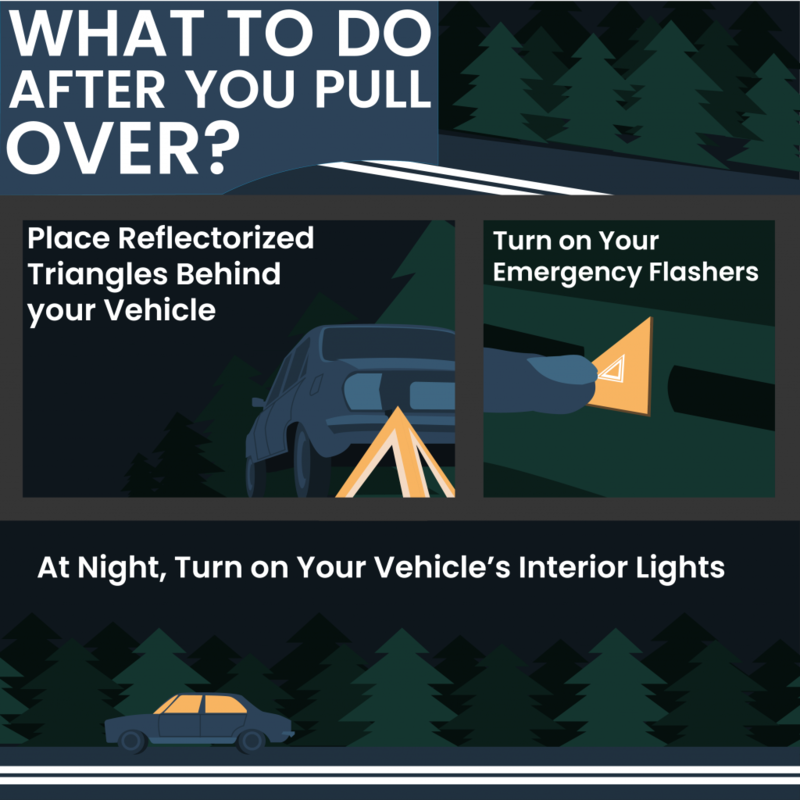 Place Reflectorized Triangles Behind your Vehicle – While these are not the most common items found in the typical driver’s vehicle, it is recommended you invest in an inexpensive set of warning triangle reflectors. These are crucial in the event your vehicle breaks down at night time on a busy road, as the triangles will provide a reflective surface for the oncoming traffic to spot easily. Turn on Your Emergency Flashers – You may already have these flashers illuminated from the process of breaking down. Keeping these on will provide an additional layer of visual safety for yourself and other drivers. These will also allow tow-trucks and other emergency vehicles to easily spot your vehicle when arriving. At Night, Turn on Your Vehicle’s Interior Lights – It is recommended you turn on your vehicle’s interior car lights at night to become easier to spot. Though, it may become harder for you to see outside of the inside while seated inside the car. It may also drain your car’s battery if you are broken down for too long. Constantly Worried about Your Vehicle Breaking Down? Enroll with DriveSmart Coverage and Receive Included 24/7 Roadside Assistance! One of the more common occurrences of unexpected breakdowns comes in the form of flat or damaged tires. 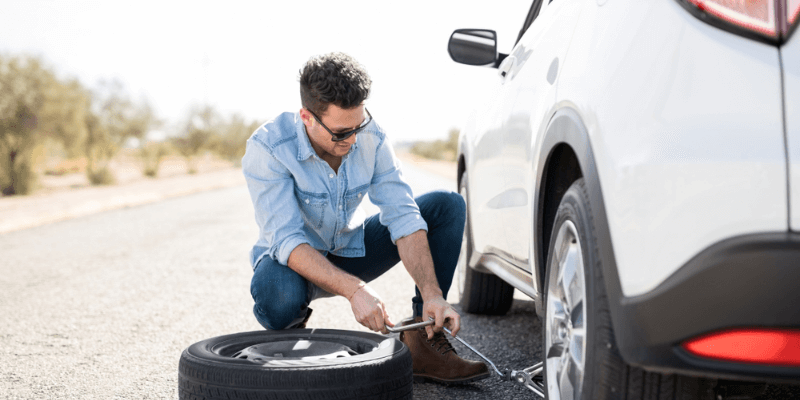 A damaged tire can occur due to a large amount of debris found on the side of the roads especially in states where roadside construction is common. While you proceed down the road, you should be attentive to the debris, potholes, and quality of the road. If you find yourself with a flat tire, your vehicle may begin emitting sounds warning you that your tires are losing air pressure. You will also feel your vehicle becoming sluggish, pulling to one side, begin shaking, or you may even have individuals informing you of a flat tire. If this is the case it is advised, you immediately pull over the avoid extensive damage to the rest of your vehicle. Car Jack – Vehicle jacks can be found at most car auto parts store or may have come included in your vehicle at the time of purchase. Lug Wrench – A lug wrench is needed to remove the screws and bolts from a vehicle’s tire. Normally, these wrenches will come with a vehicle at the time of purchase and will be in either an X or an L shape. Wheel Wedges – Wheel wedges are the only component that doesn’t come standard on a vehicle at the time of purchase but are relatively inexpensive. It’s also common to see individuals keeping cinderblocks in the back of their vehicle in place of these wedges. Depending on the offering of the manufacturer at the time of purchase your vehicle may have come with a donut spare tire. A donut tire is a temporary tire provided for your vehicle to be used while your vehicle’s tire is inoperable. This donut tire is recommended only to be operated for a total of 70 miles after installation. While in use, it is recommended to avoid exceeding 50mph, as faster speed could cause the donut tire to warp or tear. For instructions on how to change your vehicle’s tire, please visit our How To Change a Tire guide. The best thing to do to avoid breakdowns from occurring is having your vehicle serviced at its recommended intervals. While this may seem like a hassle the older a vehicle gets, it is important to keep up with the recommended maintenance to avoid breakdowns from occurring. On average, 35% of Americans neglect to have the average repair done to their vehicle, which contributes to the overwhelmingly large number of breakdowns that occur yearly. In 2015, the record number of breakdowns in the US alone reached a staggering high of 35 million vehicles. Since then, the number has only continued to increase as the ages of vehicles are becoming higher, which requires a larger amount of upkeep not provided by some vehicle owners. Vehicles that are 10+ years old are twice as likely to break down while on the road. What is more concerning is that they are four times more likely to require towing than younger vehicles are while on the road. Since vehicles rely on moving mechanical parts for their operation, it’s inevitable that those mechanical parts will require some type of servicing throughout the vehicle’s lifecycle. Whether that service is a tune-up, a repair, or a total replacement, the costs associated with servicing a vehicle’s moving mechanical parts are typically large. These high costs discourage most drivers from providing their vehicle with the routine maintenance that their car desperately needs. When it comes to preparing yourself for the future breakdowns that may come your way, DriveSmart offers protection that cannot be found anywhere else. Hundreds of thousands of drivers rely on DriveSmart for not only comprehensive vehicle component coverage but for the benefits that come along with all of DriveSmart’s extended auto warranty plans. Roadside Assistance – 24/7 immediate assistance that includes lock-out assistance, flat tire assistance, fuel delivery service, a battery jumpstart, and towing assistance. Trip Interruption – If your car is held overnight and you’re traveling more than 100 miles away from your home, DriveSmart will cover the costs associated with meals and lodging for up to three days. Car Rental Assistance – If you’re waiting for your vehicle to be repaired and require a rental car, DriveSmart will assist you with securing a rental car and cover the costs for up to 5 days. DriveSmart’s protection plans can be added onto any vehicle of any age. By covering the costs of routine maintenance for the first year, drivers feel incentivized to bring their vehicles in for the routine maintenance it requires. Consequently, drivers can keep their car running for much longer. If a covered mechanical issue or malfunction is discovered during the introductory maintenance in an early stage, drivers can have these issues solved before they can develop into something more serious and detrimental. The protection that DriveSmart provides is leading in the industry and cannot be found anywhere else. Millions of drivers throughout the United States and Canada rely on DriveSmart to keep them protected from not only unexpected and expensive repair costs but from the dangers associated with breaking down while on the road.